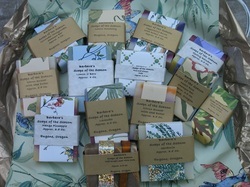 Barbara's Soaps of the Season was started because I got interested in making soap about seven years ago. Logically all of my experience in the kitchen previously had been centered around food and now, in the last few years, I have been making soap in my kitchen. One thing has led to another and because of the great response and suggestions from my customers, I also now make lips balms, lotions, shaving and shampoo bars, and natural deodorant too. You will notice that besides reflecting the seasons, my soaps also have a not so subtle relationship to food. Many of the colors make them look like sorbets and many use scents of spices. I also love to garden and like to use plants from my garden to highlight the pictures of my soaps. My home in Oregon gives me the privilege of living in a beautiful environment where the seasons are all different. It makes sense to me that the soap I make would reflect the seasons of the year in both their colors and their scents. I live in a beautiful and clean place and the soap I make is simple and uses traditional methods that have been around since the pioneer days and before. I also believe that using bar soaps and bar shampoos is important since it means generating less plastic. I am doing a lot to make eco-friendly soaps, shampoos, and lotions. The ingredients that I use are also simple and natural. I started making soaps using animal fats since that was the traditional method but after a year I switched to making all vegetable soaps because I think these are much more appealing to my customers. All of my soaps are made using the cold process method. My favorite recipes use shea butter and avocado oils among others and I know these give my soaps an added richness and moisturizing quality. I try to make my life simple too by riding my bike as much as possible since in Eugene we have so many great bike paths. Living in Eugene helps me appreciate a community that supports local businesses and works toward using fewer fossil fuels. I recently retired and now am able to devote much more time to my little soap business and am gratified by the wonderful comments that my customers make about how much they love my soaps and lotions. I hope you enjoy my soap too. It's beautiful, smells great, and will help you feel healthy and smelling good too. We also sell at Saturday Market in Eugene where you can find me and my husband every week. I am also open to taking custom orders and am always interested in trying new combinations of scents.